Dimensions: 25 ft h x 80 ft lg. 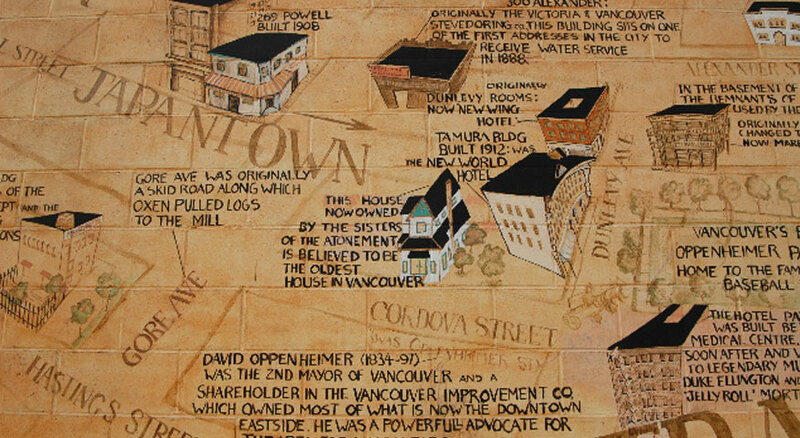 This is a map commemorating landmarks and buildings in Strathcona, mostly North of Hastings Street. The number of buildings of that age or older that still exist in the area is a surprising illustration of the longevity of the area. Acrylic on concrete block. Six people were employed thru Sandy MacKiegan and C.E.T.A. Paint and a scissorlift were provided by Vancouver Graffiti Mgmnt. Sponsorship was by the Strathcona Business Improvement Assn.